Chicken, Quinoa, Flax, Lentils, Carrots, Celery, Apples, Bananas, Blueberries, Cranberries, Pumpkin, Spinach, Garlic, Vitamin A Supplement, Vitamin D3 Supplement, Vitamin E Supplement, Niacin Supplement, Iron Proteinate, Calcium Carbonate, Phosphorous, Zinc Proteinate, Riboflavin Supplement, Thiamine Mononitrate, Potassium Chloride, Manganese Proteinate, Copper Proteinate, Magnesium Chloride, Pyridoxine Hydrochloride, Vitamin B12 Supplement. For each cup of Grandma Lucy's Valor, add 1-2 cups of warm water. Valor is a bold food that has risen above the rest to bring pets a diet with only the top ingredients known to be some of the healthiest in the world. 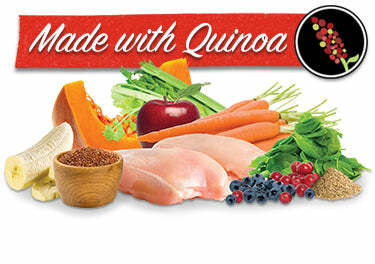 Quinoa is not a new food but actually a main staple of the ancient Inca diet. The United Nations termed 2013 the official International Year of Quinoa to celebrate this “SUPERFOOD” and all of its protein and nutrient rich characteristics. All of Grandma Lucy’s foods are hand-crafted in small batches to ensure the freshest food possible. We produce all of our freeze-dried foods ourselves in our healthy food factory in Rancho Santa Margarita, California. This allows us to keep a close eye on every step of the production process to bring your pet a safe and healthy food. By blending our high-quality meat, fruits and vegetables with quinoa, Grandma Lucy’s is proud to offer this highly nutritious super-PET-food, VALOR.